President Trump and first lady Melania Trump offered their condolences to the Bush family during a private visit to Blair House Tuesday afternoon. As they arrived at the official residence just across Pennsylvania Avenue from the White House, the Trumps were greeted at the entrance by the former President George W. Bush and former first lady Laura Bush. 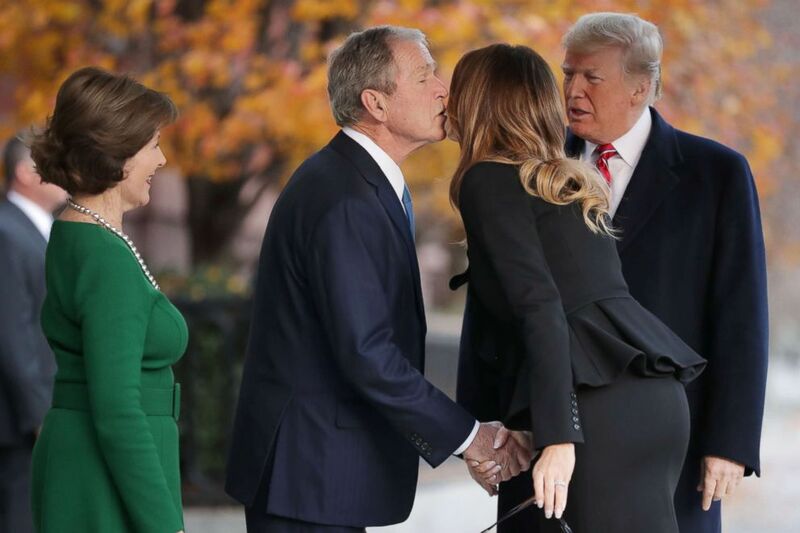 Former first lady Laura Bush and former President George W. Bush greet President Donald Trump and first lady Melania Trump outside of Blair House, Dec. 04, 2018 in Washington. 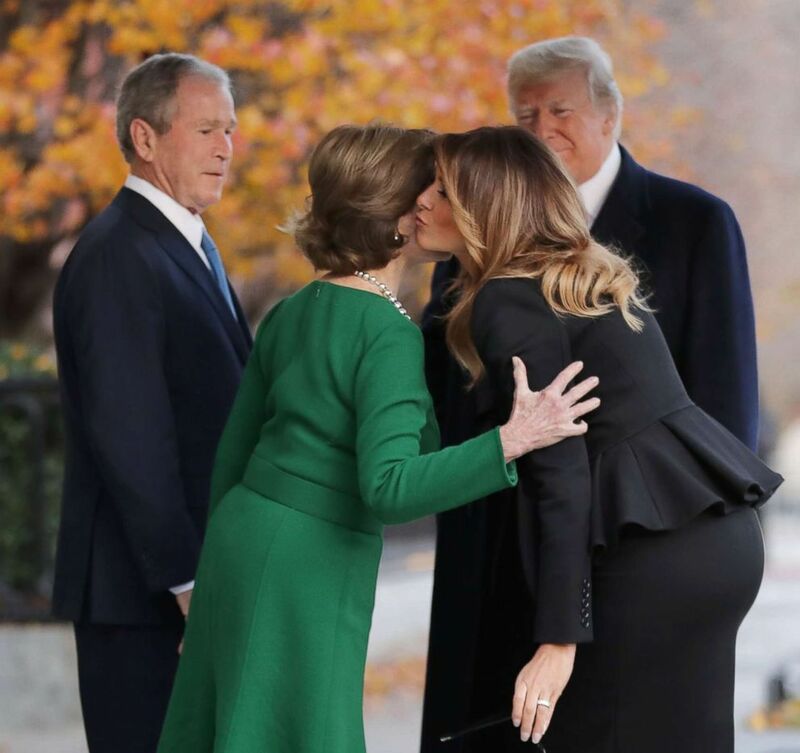 President Trump extended his hand to warmly greet the former president with a smile, and the first ladies both kissed each other on the cheeks. Trump tweeted this morning that he would be visiting the "wonderful Bush family" later in the day. Looking forward to being with the wonderful Bush family at Blair House today. The former First Lady will be coming over to the White House this morning to be given a tour of the Christmas decorations by Melania. The elegance & precision of the last two days have been remarkable! The president also said that Melania Trump would be giving Laura Bush a tour of the White House Christmas decorations and the former first lady posted a photo to her Instagram account showing members of the Bush family posing in front of George H.W. Bush’s portrait hanging in the White House, draped with a black cloth. Former President George W. Bush and his close family are staying at the presidential guest house while in Washington for the official state events surrounding the late President George H.W. Bush’s funeral. Trump's visit with the Bush family, which lasted 22 minutes, was the first public interaction between Trump and the Bush family since his inauguration. As he left, the president did not answer reporters' shouted questions about what message he had for the Bush family. In his morning tweet, Trump noted: "The elegance & precision of the last two days have been remarkable!" -- complimenting the official proceedings which have been closely planned between the Bush team and Trump White House. 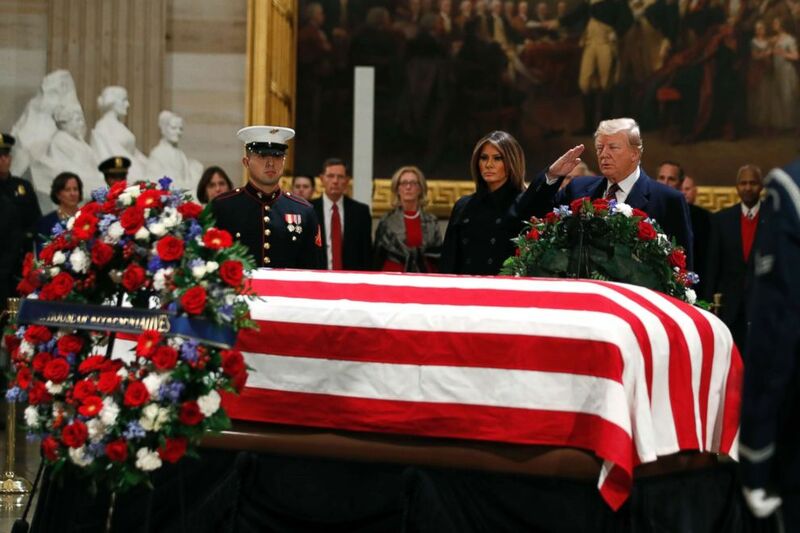 President Donald Trump and first lady Melania Trump pay their respects to former President George H. W. Bush, as he lies in state in the Rotunda of the U.S. Capitol, Dec. 3, 2018. The president and first lady made a trip to the U.S. Capitol Monday night to pay their respects to the late president Bush, lying in state in the Capitol Rotunda ahead of the state funeral Wednesday. The Trumps will attend but he is not scheduled to speak. A person familiar with the arrangements said the Bush team and Trump White House have been in close contact in planning an eventual funeral for the elder President Bush for months, marking a departure from what has been a long-running feud between President Trump and the Bush family. During the 2016 campaign, then-candidate Trump mocked former primary rival Jeb Bush as "low energy" and has also been fiercely critical of former President George W. Bush, even once describing him as the "worst" president in U.S. history.